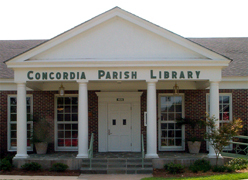 Library details: Concordia Parish Library is a Public library. This library is affiliated with Concordia Parish Library (view map) . The collection of the library contains 75,070 volumes. The library circulates 101,648 items per year. The library serves a population of 20,365 residents . Administration: The director of the library is Amanda Taylor .